Happy Wednesday and of course, a very happy Veteran’s Day! 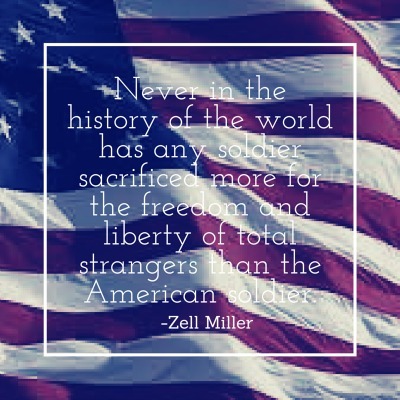 Thank you to all the veterans who have served and continue to serve our country. 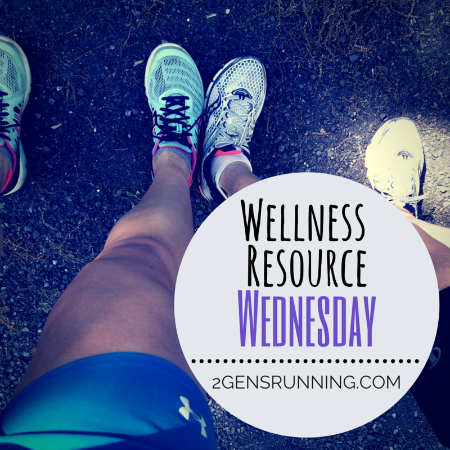 And because it is not only Veteran’s Day, but also Wednesday, I’m sticking to the new routine and sharing a health/wellness resource I recently discovered and absolutely LOVE. I’m a big fan of podcasts. I like to put them on while I go to sleep to keep my brain from going haywire thinking about work/running/chores, etc… I also listen to them on the subway during my commute in the mornings. It makes the start of each day a little more enjoyable, and I love the random tidbits of knowledge I pick up listening to them. 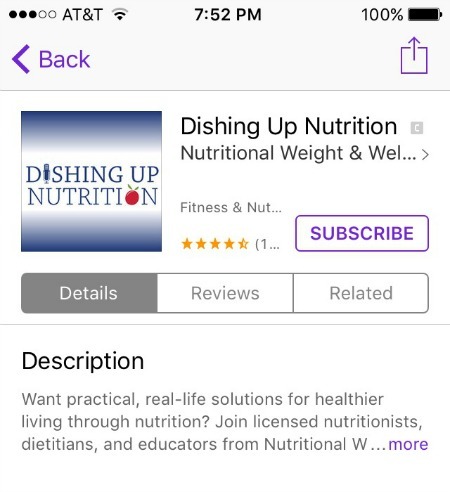 Since deciding that I wanted to focus more on nutrition this Fall, I wanted to find a podcast to actually learn about what it means to have a balanced diet. Obviously, I understand the concepts of healthy eating broadly (I think pretty much everyone does. In a nutshell- eat more vegetables and fewer cupcakes.) I knew there were a lot of nuances I was probably missing though. After browsing the internet for podcasts related to health and wellness, I came across Dishing Up Nutrition and I’m so glad I did! The podcast features several licensed nutritionists from Nutritional Weight & Wellness, a Minnesota-based company (which means cute accents that make me smile to myself). They cover a HUGE range of topics – from the mineral connection to cravings (an episode I found extremely interesting! ), to gluten and Celiac’s disease to the psychology of weight loss. And that barely scratches the surface of what they cover! I love that it’s not a podcast focused around dieting and losing weight, it’s much more focused on overall health and eating in a way to make your body feel its best. And the advice they offer is practical. No insane crash diets being recommended here. I eat too many refined carbs. I’m a big fan of toast. As a pre-run breakfast, it’s great. It’s easy and quick and I love to eat it with a good smear of jam (more simple carbs) But as far as a balanced diet goes, I should be taking in most of my carbs in the form of complex carbs from vegetables like sweet potatoes, squash, and broccoli. Fun, yes. Nutritionally balanced, no. So what changes am I implementing? I’m switching up my breakfast routine to scrambled eggs with assorted veggies (broccoli, mushrooms, squash, peppers, tomatoes, brussel sprouts -> I’ve found I really enjoy ALL of these in different combinations with eggs!) I’m not completely eliminating my toast, but I am going to try to reserve it for morning runs and early gym trips. I started taking a zinc supplement. After listening to a podcast on the mineral connection to cravings, I realized there were several risk factors for zinc deficiency that fit me. And, low levels of zinc can lead to intense cravings for sweets after a meal (DEFINITELY me). So, I’m trying the supplement and waiting to see if it helps me get those sugar cravings under control. I’m trying to be more regimented about snacking, and aiming to have a little protein, fat, and carbs in each snack. With traveling so much, I haven’t actually had time to really experiment with snacks yet, so I will have to report back on what kind of snacks I make for myself! This entry was posted in Musings, Reviews and tagged Diet, Dishing Up Nutrition, Nutrition, Wellness Resource Wednesday. Bookmark the permalink. Interesting about the zinc supplement! I crave sweets after every meal. I am so looking into this. Thanks for the resource! Comes at a good time for me because I am cleaning up my diet over the next few weeks.